Novembers Supplement of the month & Pajama Drive! Yearly we have our cholesterol levels checked. Abnormal cholesterol levels such as high LDL or low HDL cholesterol are a major risk factor for heart disease and stroke. An unhealthy diet can cause high cholesterol. Sometimes high cholesterol runs in the family. Beside diet and exercise to control cholesterol, Dr Burtis also recommends supplementing with niacin and/or red yeast extract. Niacin 500 mg Sustained Release is a B-complex vitamin that can lower cholesterol. It reduces the production LDL and VLDL in the liver and increases the production of beneficial HDL which draws cholesterol away from the lining of the arteries. Specifically, it reduces bad cholesterol (LDL cholesterol) and increases good cholesterol (HDL cholesterol). Niacin also dilates the blood vessels which improve circulation and helps flush out existing plaque. Niacin Sustained Release is formulated to release part of the niacin quickly, with the remainder being released over several hours with little or no flushing. In certain individuals, Niacin may produce flushing, tingling, itching and feeling of warmth which under normal continuous use will disappear. However, if conditions persist, contact Dr. Burtis. Red Yeast Rice is most often used by those who wish to have healthy cholesterol levels. It is literally red yeast that grows on a particular type of rice. It’s been eaten in China as a spice for over 500 years. The yeast itself contains a family of substances called monocolins, which lower cholesterol by inhibiting cholesterol production in the liver in the same manner as prescription statin drugs. 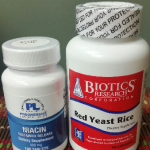 Improved circulation of blood is one of the potential benefits of taking red yeast rice. We also encourage you to participate in the nutritional classes November 19th at 2:00p.m. Dr. Burtis is going to cover “Healthy Ways to Manage Cholesterol”. This class is free so bring a friend! We will be collecting NEW Pajamas at Burtis Chiropractic Center for the month of November until December 11th. Burtis Chiropractic Center will match each set of NEW Pajamas donated. We will be donating these pajamas to Iz-Bee Jammies a nonprofit organization. Iz-Bee Jammies will be handing these out to local hospitals in Minnesota. Each Pajama set you donate will qualify you for a chance to win a prize. The winner will be drawn on December 14th!